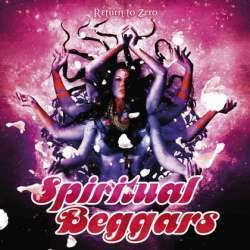 Spiritual Beggars from Sweden have been around for nearly two decades in which they time and again amazed with great hard rock, stoner and psychedelic riffs. Five years after their last album, their meanwhile seventh record Return To Zero sees them return to form by delivering their trademark strengths. The microphone is now in charge of Apollo Papathanasio (Sandalinas, Firewind) whose vocals blend in well with the music. All five musicians have made themselves a reputation in other bands, most notably band founder and guitarist Michael Amott (Arch Enemy, Carcass), which may explain the sometimes long intervals between albums. Return To Zero is once again a musical trip into the early Seventies. The short intro is followed by deeply tuned guitars and strange organ sounds, putting you into the right mood for incense sticks. The band’s darker and more dramatic songs remind me of Arthur Brown, while their more classic hard rock excursions feel reminiscent of Uriah Heep. The middle of the album suffers a little with the overly long Spirit Of The Wind, followed by a couple more traditional retro rock songs with strong stoner influences, but maybe a little too bluesy for my taste. The album ends with the hypnotic Dead Weight and the ballad The Road Less Travelled that draws parallels to Nazareth. Despite its nearly one hour long length, Return To Zero has become an album that can be easily listened to in one sitting. There are moments that capture your attention, while others may leave you lose your focus a little, but overall the album leaves a good impression, even though it can’t quite achieve the greatness of its predecessor Demons.